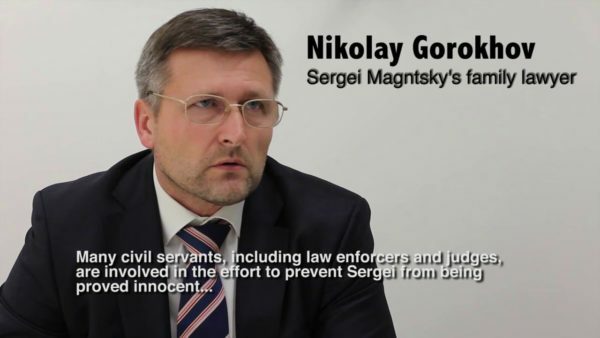 Nikolay Gorokhov, a lawyer for the family of Sergei Magnitsky, the Russian lawyer whose death in 2009 sparked a crisis between Russia and the West, has been badly injured. According to Russian media, Nikolay Gorokhov fell from the fourth floor when a rope snapped as he and others tried to lift a bathtub into his house near Moscow. The lawyer was flown to hospital by helicopter, a medical source was quoted as saying. However, British businessman Bill Browder, for whom Sergei Magnitsky worked, said Nikolai Gorokhov had been “thrown”. Bill Browder did not give a source for his allegation. According to a press release on a website linked to Bill Browder, Law and Order in Russia, Nikolay Gorokhov was due to appear in an appeals court in Moscow on March 22 to contest its refusal to investigate allegations of organized crime. Sergei Magnitsky died in prison after revealing alleged fraud by state officials. The incident involving Nikolay Gorokhov occurred in the town of Troitsk, south-west of Moscow. Russian media said several workmen were helping the lawyer at the time. Footage on Russian media showed pictures of the tub and the debris of a wooden structure beside it. One man described as a witness told Russia channel NTV that a delivery company had offered to carry the tub up to the fourth floor but that Nikolay Gorokhov had said he would winch it up the side of the building himself. “He tried to use a homemade mechanism to lift it to the fourth floor. While he was doing that the winch got jammed. He went to fix it a bit and fell, with the jacuzzi and the makeshift scaffolding which landed on top of him,” the man said. His comments appeared to indicate the workmen were on the ground at the time of the accident. Sergei Magnitsky was jailed after being accused of committing fraud himself. Supporters say his death in November 2009 was the result of a severe beating, but official records say he died of acute heart failure and toxic shock, caused by untreated pancreatitis. He had acted as a legal adviser for London-based Hermitage Capital Management, founded by Bill Browder (formerly a US citizen), who was himself tried in absentia. The Magnitsky affair soured relations between Moscow and Washington, casting a spotlight on corruption in Russia. The case led to US sanctions on a group of Russian officials, retaliation by Russia and the bizarre spectacle of Sergei Magnitsky being put on trial posthumously.